A Chicago man who planned to travel to Somalia to fight for a terrorist group pleaded guilty on Monday to terrorism-related charges. 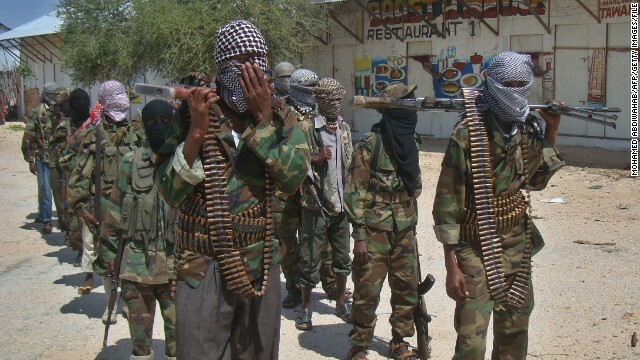 Shaker Masri, a 28-year old U.S. citizen, pleaded guilty to attempting to provide material support for Al-Shabaab, a group he knew the United States had designated as a foreign terrorist organization, according to prosecutors. In his plea agreement, Masri said that on July 19, 2010, he told an associate he "wanted to travel to a conflict zone to engage in jihadist fighting" and that he had the choice of going to Afghanistan to help al Qaeda or travel to Somalia to aid Al-Shabaab. Masri told his associate he had decided to go to Somalia but he needed money. The associate - who was actually a source assisting law enforcement - said he would help Masri but insisted on going to join Al-Shabaab as well. Masri agreed, according to the plea agreement. Over several weeks Masri and his associate worked on their travel plans including "how to conceal their departure, the financial costs of the journey, the necessity of supplies, and the weapons they would need to acquire in Somalia." Masri explained that they would be traveling to a part of southern Somalia that was controlled by Al-Shabaab and said "he expected that they would be placed with a brigade of al-Shabaab's militia comprised of foreign fighters." According to the plea agreement, Masri said to avoid suspicion they should not travel directly to East Africa. Instead Masri decided on a route through California, Mexico, and then a "Latin or South American country that did not work with United States' law enforcement" and then on to East Africa. Masri told his associate that once they left for Somalia they would be "wanted men." Masri also told his associate that he needed to get rid of his laptop because it had information that could be incriminating, and buy a new one. In late July Masri and the man he believed to be his co-conspirator purchased one-way tickets to California to begin their circuitous journey. On August 3, 2010 - the day before their scheduled departure - Masri and his associate drove to a liquor store where the associate allegedly picked up $18,000 to fund their trip. Next they went to a store to buy a new laptop. Masri was arrested when he left the store. Earlier in his case Masri also was charged with attempting or conspiring to use a weapon of mass destruction outside the United States. A criminal complaint charged he wanted to wear a suicide vest and become a martyr with an attack on "infidels." Under the terms of the plea agreement that charge was dropped. Masri is scheduled to be sentenced on October 16, and his plea agreement calls for a sentence of nine years and 10 months in prison on the conspiracy to provide material support charge. usa and britain are doing this because they cant handle china rise china has surpassed usa and britain at every level from space science to the deep ocean science from computer science to science in optics and laser so usa and britain no that they have lost against china. this is why usa is supporting terrorism in syria usa has also posted pictures of dead people on youtube from syria this is illegal they law clearly says that snuff videos are illegale but usa has turned youtube into a proganda engine. saeed... if you knew anything at all about the USA/China relations you would know that it is the United States that has advanced China to place it is today. The USA sent almost all of our manufacturing businesses to China. You can hardly buy anything in America that was "Made In China" tagged. When Bill Clinton was President he allowed missile guidance technology to be sold to China that advanced the Chinese targeting systems for their missiles by at least ten years. If it weren't for America China would still be bankrupt communist nation. It is America that is advancing the Chinese in every endeavour that you mentioned. It is called Redistribution of Wealth. 66th Strategic Command & Operations Unit. Wow! – that's clever. Did you come up with that all by yourself, or did mommy give you hand? Your replies are as offensive and repulsive as your name... sodomite. I'm sure you engage in it often. I respond to someone making a peurile, racist comment, yet I'M the "offensive and repulsive" one? Nothing on these boards other than whining little snots and their jejune fantasies. BTW, what does the "T" stand for? Tw@t?, Tool?, Twit?, Turdboy? He needs to stripped of his citizenship and deported. Let him taste the difference for life. Yeah, let him reside in another country that has a decent standard of living. Most importantly, Masri´s sentence should be a public deterrant to similar activities by like-minded individuals. Public execution would work. There need not be a plea aggreement for conspirators against the USA. Short of capital punishment, Masri could be put into work camps to earn the cost of his permanent deportation/expulsion from the USA. Git-mo would be a fine alternative. Lastly, this man conspired with mortal enemies of the USA; he deserves death. No replies from Arabic persons or those who conspire against our stars & stripes. Let's start with yours first. No Sodomite, we´ll through your family in-camels, snake-charmers and all! Think carefully before you insult another American. We tend to take matters into our own hands when provoked. I see that you're an ardent proponent of free speech, TopView, hence your zeal to threaten anyone who says something that you don't agree with. Your hypocrisy is truly breath-taking. Can he prove it? If so, deport him anyway at his expense. We could put him in work camps first for free labor.